This country is so wonderful to travel in and has amazing scenery. Even lots of men I have meet say it’s beautiful. Not usually a word they would use so it must be true. And it is!! Guatemala City itself is not all that clean and most tourists only stop off here if they are catching an early morning flight out or get in late. There are cathedrals and plazas worth visiting though. I flew in mid-morning and caught a shuttle van to Antigua. This is a small town with some very old buildings, churches and a ton of history to soak up. There is a hill behind the town and this gives you a great view of Antigua. It is not dangerous to go walking up here alone and there are Police on duty. (For some time there was a problem with youths robbing people on the pathway). Guatemala is another of the cheapest places you can visit next to Bolivia. There is shopping and fashion for everyone. I brought a pair of jeans there that are still my favourite pair today. Cost -NZ $16. So cheap!! Go to the markets. Like all markets they have everything for sale, from fruits to blankets, and the colours are brilliant, even one of the fruits I tried was brilliant purple. Almost every little town in Guatemala has a museum. Guatemala has so much history and today though Spanish is the official language something like 20 dialects of Mayan are spoken. No worries, all tour operators and agents speak English. My great aunty lived in Guatemala for 4yrs on the Pacific Coast. It’s beautiful here also and is being developed at a steady pace as more and more visit all the coast area. Let’s not forget places like Petén, Chimaltenango and Quetzaltenango. All on every backpackers list of ‘must go’ places. But my favourite is the pyramids at Tikal. 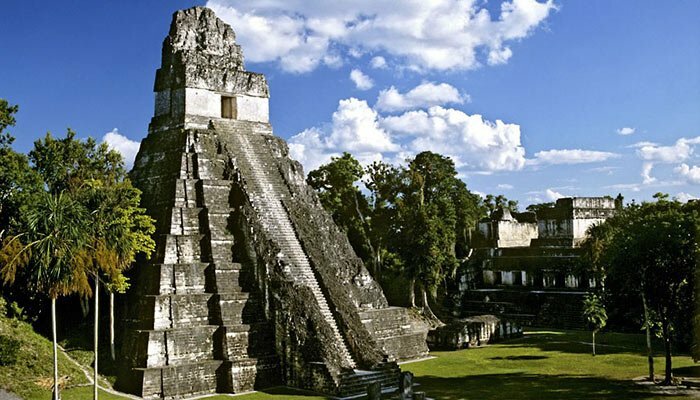 Tikal National Park is a, UNESCO World Heritage Site, as are some of the other places I have seen. Tikal was an experience that I can’t describe. Sitting at the top of the tallest pyramid, looking down on the whole site, see the top of other pyramids pointing skywards above the trees, the sound of birds, monkeys. I could hear the Mayan children, of the pyramid era, running and playing below. It’s a riveting site and fortunately for visitors you are allowed to climb the pyramids. The town to stay in to visit here is Flores. It’s approx. an hour’s bus ride to Tikal. No need to book a bed in Flores as there are loads of hostels and hotels. The hostel/hotel can book you on the bus for Tikal as soon as you get there. From Flores I took the bus through to Belize City. Talk with the locals. Most of them just want to practise their English. Not good for us if we want to practise our Spanish. Spend your money. It’s cheap and remember Guatemalans are very poor. I had the unfortunate experience of hearing someone moan about the price of a souvenir. How I keep my mouth shut I will never know! A must do is Tikal. This is one of the few places you can still climb the pyramids. You can’t do this anymore at Chichen Itza in Mexico, so do it here while you have the chance. If it’s a hazy day in Flores when you get there be sure to watch the sun go down. I have some fantastic photos of the sunset over the lake. Climb a volcano. If you do the active volcano close to Antigua, take marshmallows or something similar to toast (and a long stick ).Take some money with you to so if the climb gets the better of you hire a horse. They follow you waiting for you to collapse. Bargain the price down here as they do charge alot and in my case where trying to get me to pay in US dollars. (I love the sense of humour of these people). It was all done in good fun, so no – I’m not moaning about the price. When you get home tell everyone to go to Guatemala. For alot of them tourism is there income but best of all, they have a beautiful country for us to visit.